4 October 2016: If a city in the United States wants to build a road, it will have to follow strict design and construction standards regarding pavement depth and materials, lane width, and traffic speed, among other regulations. City codes typically also regulate such actions as sidewalk vendors and property maintenance. Often, local urban planning and economic development proposals require public hearings. Local policing, however, is rarely regulated in the same way. A local police chief, for example, may institute a zero-tolerance “tough on crime” approach to policing, or, conversely, a community-oriented “feet on the beat” strategy to leverage the power of residents to fight crime. A police chief may direct his or her officers to deploy drones or body cameras or military vehicles. In other words, local police departments have wide discretion to implement various policing tactics without seeking written permissions or public input or following officially-adopted protocol. 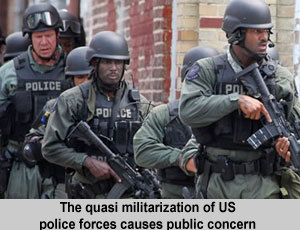 Essentially, local police in the United States are entrusted to maintain public safety by enforcing laws broadly. To some observers, the shortcomings of such broad discretion may be seen in the poor police-community relations in many American cities and tragic episodes of violence. In response, a group of criminal justice practitioners is proposing that police departments be authorized democratically in the same way that the rest of local government is. The group is organized under the auspices of the American Law Institute (ALI), an independent organization which produces scholarly work aimed at making the law more clear, practical, fair, and useful. The exact content of the new ALI initiative is being determined, but will look at police investigation in terms of the principles of American law. Topics under consideration include eyewitness identification, forensic evidence-gathering, search and seizure, and public accountability. Currently, over 150 organizations participate in the ALI initiative. Participants represent local law enforcement agencies, university law schools, civil rights organizations, private law firms, state and federal courts, as well as the mayor’s offices of Nashville, Tennessee and Gary, Indiana. Participants bring their own strengths and perspectives to the table. For example, the new Policing Project at the New York University Law School, a participant in the ALI initiative, focuses on surveillance, seizure of persons or property, and the use of force with a goal of “promoting legislative authorization of police tactics, police utilization of public rulemaking, and data-driven policing,” according to attorney Barry Friedman, founder of the NYU project and reporter for the ALI initiative. The deaths of unarmed black men at the hands of police in Ferguson, Missouri, New York City, and Baltimore, Maryland, as well as the ambush killings of police officers in Dallas, Texas and Baton Rouge, Louisiana placed a spotlight on police-community relations in American cities and challenged American ideals of equity. A federal inquiry after Ferguson documented racial biases and unconstitutional practices in the Ferguson Police Department. A US Department of Justice report found police officers in Ferguson exhibited personal biases against people of color, as well as a widespread and willful blindness within city government and the court system to the police department’s problems. For example, the city of 20,000 residents had 30,000 outstanding arrest warrants. “It was seen as less harmful if black people went to jail,” said Christy Lopez, deputy chief of the DOJ’s Civil Rights Division, which oversaw the investigation. The deaths must also be seen in the context of declining crime rates in the United States. Despite fluctuations in certain offenses, crime generally is at its lowest point in decades in American cities, including poor and minority neighborhoods. However, as the reports from Ferguson and other cities make clear, the declining crime rates often mask an enormous over-enforcement by local police, which occurs in racially discriminatory ways. In other words, according to Friedman and other participants in the American Law Institute initiative, the law is part of the problem and also part of the solution. Their proposed solution is to regulate policing like the rest of local government, “with rules that are in place before officials act, which are public (i.e. transparent), and which are formulated with public input,“ according to Friedman. The participants in the ALI initiative will look at various models and best practices around the US for promoting democratic engagement around policing. Bringing all the stakeholders together and balancing their interests in a process of democratic engagement will not be a simple task. The right questions have to be asked about the means and ends of policing. Are any means justifiable to reduce crime? 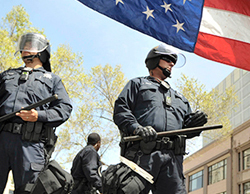 What are the costs and benefits of different policing tactics? With evidence-based answers, legislation can guide the design of policing processes and set the parameters for rules. Rules and protocol can then be established to guide the administration of police departments. As Friedman points out, policing is essentially an administrative function. And meaningful public involvement throughout the process can provide legitimacy for new and revised policies, laws, and actions. All of these activities unavoidable deal with human nature, with individual victims and their families and communities, with deeply-rooted power structures, with vested interests, with anger, frustration, mistrust, disappointment, and fear. Change will require new data, but also new levels of empathy. President Obama has said that there are no easy solutions to the nation’s racial problems, and Americans will “have to grind it out.” Still, many people see rising from the unfortunate tragedies over the past few years in American cities a genuine opportunity to transform police-community relations and make the criminal justice system work fairly for all. Broad-based collaboration to re-examine laws and their application and enforcement offers one such opportunity. “Policing simply will not be on a firm footing until it has a democratic pedigree,” asserts Friedman. “Of Law and Order”, NYU Law Magazine, Vol. XXV, 2015, p5. The American Law Institute, “Principles of the Law: Police Investigations”, https://www.ali.org/projects/show/police-investigations.